Air traffic control (ATC) directs aircraft in the sky and on the ground to safety, while the Aeronautical Telecommunications Network (ATN) comprises all systems and phases that assist in aircraft departure and landing. The Aeronautical Telecommunications Network: Advances, Challenges, and Modeling focuses on the development of ATN and examines the role of the various systems that link aircraft with the ground. The book places special emphasis on ATC—introducing the modern ATC system from the perspective of the user and the developer—and provides a thorough understanding of the operating mechanism of the ATC system. It discusses the evolution of ATC, explaining its structure and how it works; includes design examples; and describes all subsystems of the ATC system. In addition, the book covers relevant tools, techniques, protocols, and architectures in ATN, including MIPv6, air traffic control (ATC), security of air traffic management (ATM), very-high-frequency (VHF) digital link (VDL), aeronautical radio and satellite communications, electromagnetic interference to aeronautical telecommunications, quality of service (QoS)-satisfied ATN routing mechanism speed dynamic environments, and service-oriented architecture (SOA)-based ATN transmission control algorithm. It also incorporates published research and technical reports to illustrate existing problems, highlight current methods and opportunities, and consider future directions and trends. 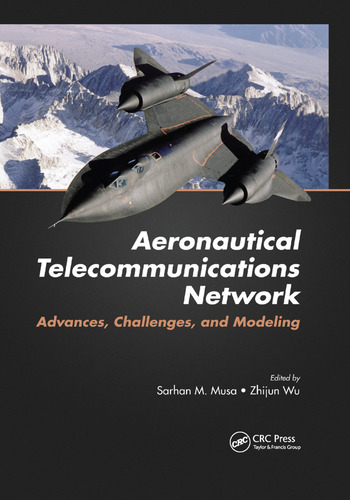 The Aeronautical Telecommunications Network: Advances, Challenges, and Modeling highlights the advances, challenges, and modeling of ATN, and implements strategies for integrating existing and future data communications networks into a single internetwork serving the aeronautical industry. This book can aid readers in working to ensure the effective management of air traffic and airspace, and the safety of air transport. Sarhan M. Musa, PhD, is currently an associate professor in the Department of Engineering Technology, Roy G. Perry College of Engineering, at Prairie View A&M University, Texas. He has been director of Prairie View A&M Avaya Networking Academy, Texas, since 2004. Dr. Musa has published more than 100 papers in peer-reviewed journals and conferences. He is a frequent invited speaker, has consulted for organizations around the world, and has written and edited several books. Dr. Musa is a senior member of the Institute of Electrical and Electronics Engineers (IEEE) and is also an LTD Sprint and a Boeing Welliver fellow. Zhijun Wu, PhD, currently serves as a professor in the School of Electronics and Information Engineering Technology at Civil Aviation University of China (CAUC), Tianjin, China. He has been director of CNS/ATM Institute, CAUC, since 2006. Professor Zhijun Wu has published more than 50 papers in peer-reviewed journals and conferences. He is a frequent invited speaker on electronics and information technology, has consulted for multiple organizations nationally and internationally, and has written and edited several books. Professor Zhijun Wu is a senior member of the Institute of Communication, Tianjin, China, and a Boeing Welliver fellow. "I think that the book is relevant in terms of its contents, treatment of the topics discussed and scope thereof. … I believe that the book will be a great contribution to the need for information on the development of ATN network for designers and engineers developers such networks worldwide." "This book gives an overview of the aeronautical telecommunications network. It provides a good introduction to the reader of the current state of ATNs, the challenges faced in using them in modern times, and the recently proposed advancements in ATN architecture to overcome such challenges. The book does a good job of explaining the basics; anyone with minimal previous knowledge of communication techniques can read the book to understand the state of the art and future direction of ATNs."